The Philippine Center for Investigative Journalism (PCIJ) is currently accepting applications to its Basic Investigative Writing Seminar. This seminar, which is open to 4 divisions, is also open to freelance writers and bloggers. Travel, board & lodging will be covered by PCIJ. 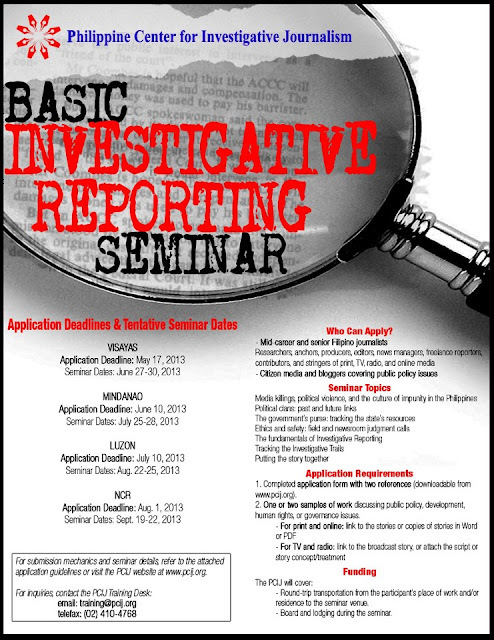 PCIJ’s Basic Investigative Reporting Seminar will cover topics like Political Clans, Governance, and Journalists’ Safety, etc.